What a sweet baby! Another new life to celebrate. Hugging you vicariously. He looks like the little turtles we used to buy at the dime store. So cute. 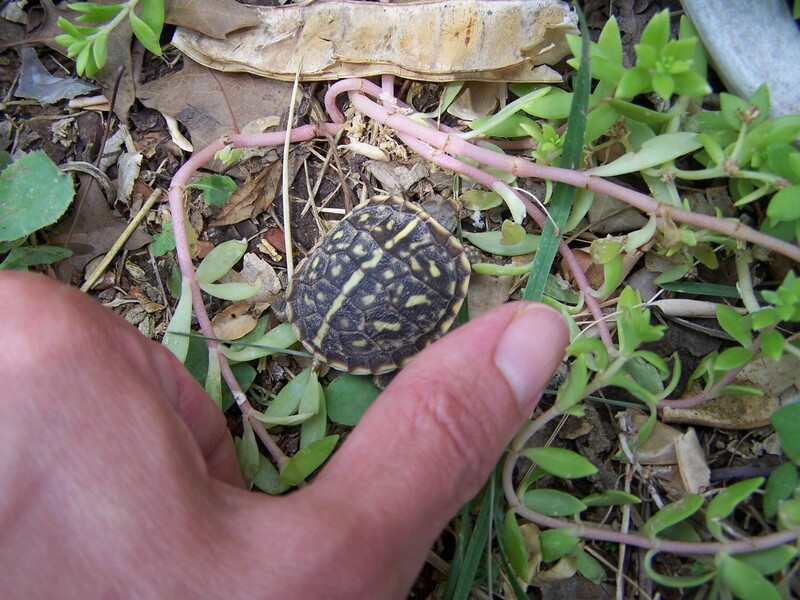 I’m so glad you are still finding surprises in your yard to make you smile. He’s a cutie! Now I see where turtle neck” came from! These are the little things that will help see you through. Hugs & more hugs. Awww!! What a cutie!! If you feed him, he’ll stay!! 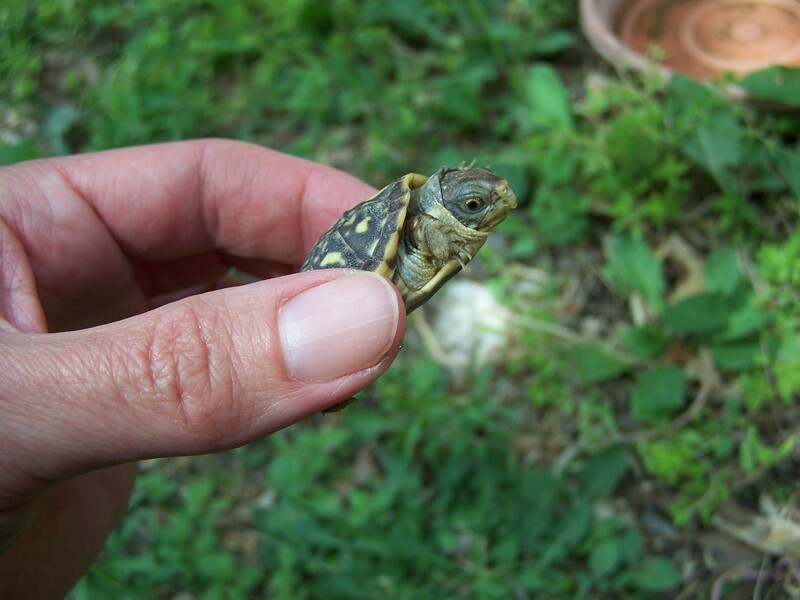 Aww – what a cute guy! I hope he stays! well I have never seen one of him in my Aussie garden. How neat! Hope he stays around. 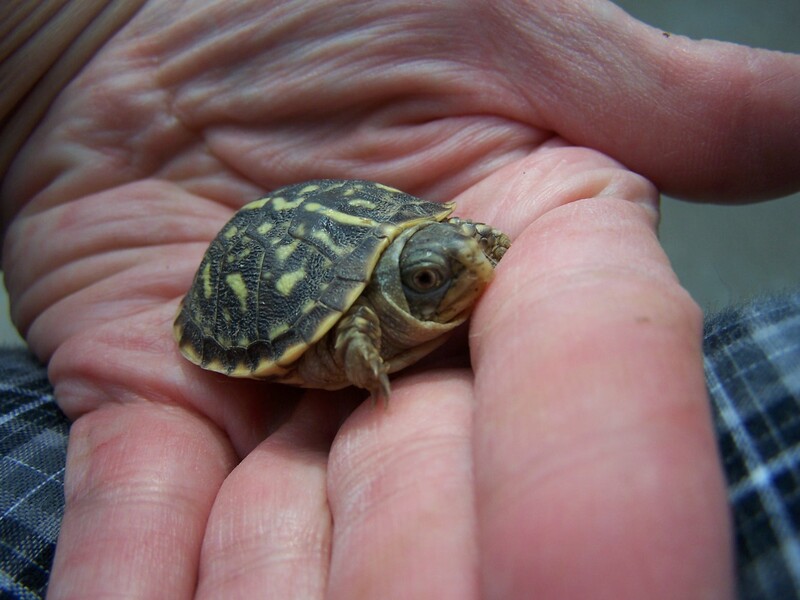 What a cute little turtle! I hope you do end up finding more of them. The wonders of nature are so good for the soul. Cute! 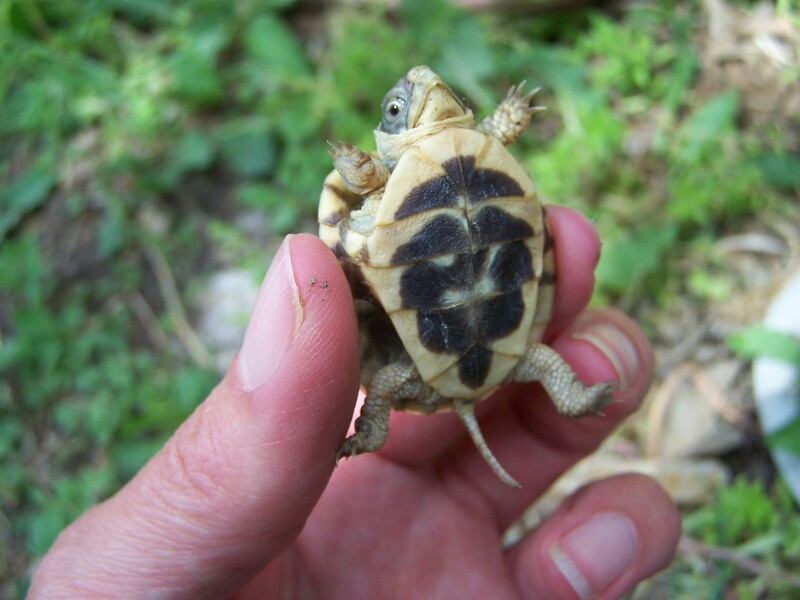 Looks a box tortoise. 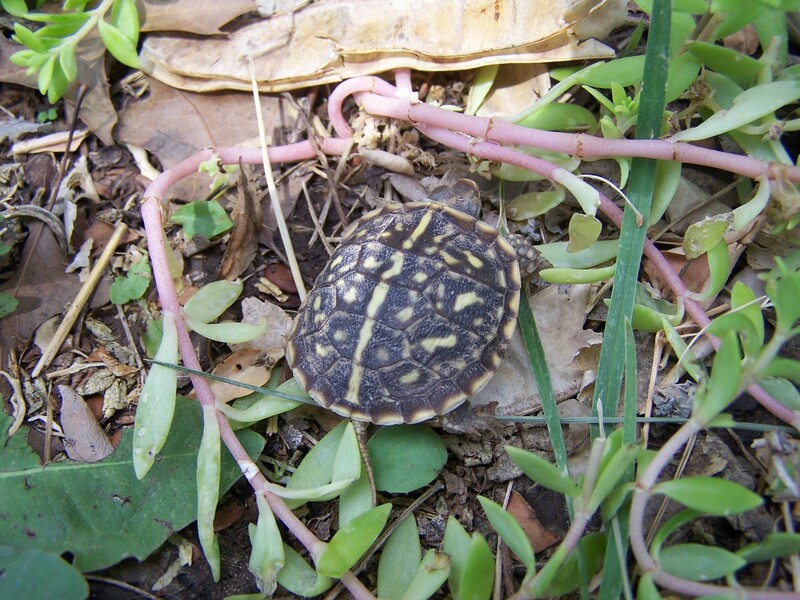 Our daughter found a baby red-earred slider (water turtle) a few years back and we still see him. We call him Geronimo. I bet he makes it just fine. Hi Randi – it’s been a while since we heard from you. I hope you are doing okay. 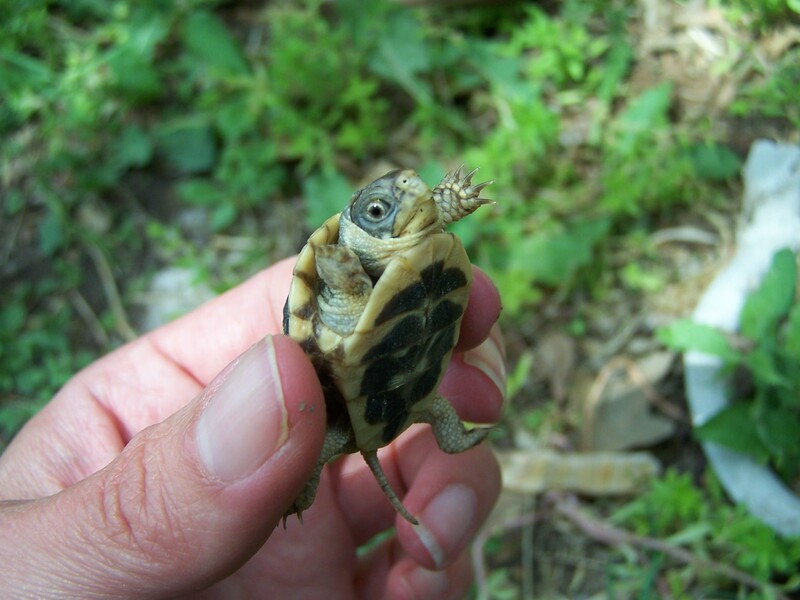 When you’ve some time, we’d love to know if you’ve found any more turtles and if you’ve been watching this little one grow. I’m just dropping off a note to say I was thinking of you. I hope the joy of quilting will help you through this journey to your new reality. I’ve read several books of fiction lately on quilting and for some reason I thought of you. A recurring theme in them was that quilting was a way to help weather trials and sorrow. I don’t know if I’m saying this very well; but, just know I wish you well. Just wanted you to know that I’ve been thinking of you. Always enjoyed your posts on the quilting forums. I’ve followed your blog for quite some time and check it often. Hope that you are doing the “best you can” right now. I’ve been thinking about you and praying you can find your zest for life again. I have enjoyed following your quilting journey for many years, and I look forward to seeing your great work. I’m so sorry to read about the passing of your husband. I empathize with you, having lost mine in March, 2010. It gets better, but not the way I expected it to. I still cry, I still miss him every day. I still wish I could have my life back. It isn’t quite as sharp, now, but holding his shirt or seeing something I know he would have liked still brings the tears to my eyes. There’s always the empty spot, but there are laughs and fun, too. A different life. I hope you are finding that, too. I see that you have faith and trust in God, and that’s the most helpful thing there is. Just wondering how you are getting on. I know you will not get ‘over it’ but has life become a little more tolerable for you?